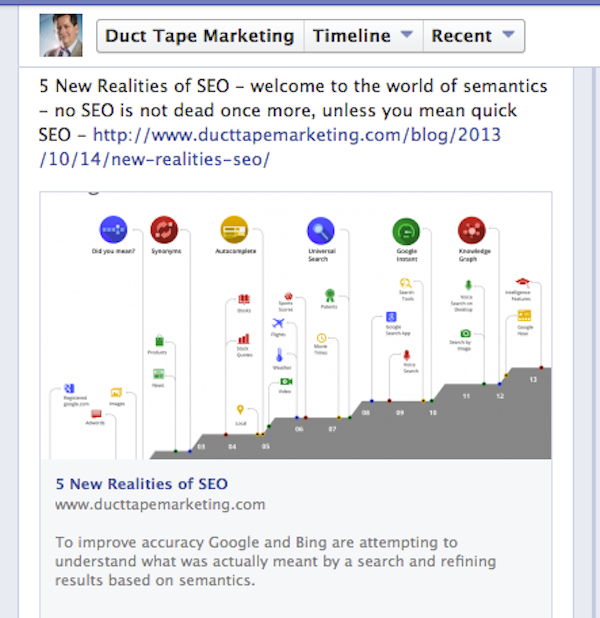 In a recent blog post I wrote about the new realities of SEO. For the most part that post revealed how the shifting form of search into a less content and more context driven world requires site owners and SEO professionals to think differently about how they approach search engine optimization. Today I want to cover a couple tactics you can quickly employ that should help in each of the areas I addressed in the new realities post. My goal for this post is to provide you with some action items to check off your list this week – as in right now! Below are my five favorite SEO action steps you can take today. Lots of people use WordPress plugins and Facebook content boxes and such to make sharing their blog posts much easier. I’ve used the Sociable and Digg Digg plug ins on and off for years. However, with the emphasis the search engines are placing on social signals, one way to get even more social juice is to add the native Google +1 button and the native Facebook Like or Share button to the main or secondary header sections of every page on your site. This way you increase the odds of your homepage and other core pages accumulating more and more social signals over time. You can grab the code for +1 button here and Facebook button here. Okay, this one’s not technically an SEO play, but it may add to better engagement on social networks, which we’ve already agreed is crucial. A recent Facebook redesign places a great deal more emphasis on images on pages by displaying them fully across a post – if they meet certain size guidelines. The greatly enlarged images make your post stand out on mobile devices as well as laptops and should be something you include in your content. The new standards call for images that are 600 to 1200 pixels in width in the open graph image associated with your posts. Here’s a painless way to embed larger image in blog posts for social networks without doubling up on work on your site. Open the WordPress image editor found in visual view and reduce the image size to make it fit your post – I use 240 px left justified images in most posts so I can adjust it here. That’s it, now when you share your incredible blog post on your Facebook page your stunning image will dominate the page. Which of course may mean you need to give some more thought to your image selection. Look for Google+ to mimic this behavior. The term long tail has been around in the search world for many years now and it’s not going away. The more competitive a search category is the more important it is that you create content meant to compete specifically for those less popular, longer phrases that people use every day. I could go into lots of detail about how your might get started in this arena, but my best advice is to use software called Long Tail Pro. It’s one of the easiest to use and best priced keyword research tools and can help you identify the best opportunities for keyword phrases you can go to work on with the hope of competing effectively. With the move by Google towards semantic intent I’ll be producing as much content as possible that narrows in on context as well as content. For my kind of business that’s done by getting as specific as possible about addressing intent. I’ve started a question of the week post where I’ll address one very specific bit of information in response to questions that come up often. When someone poses a question in search the intent is often quite clear. Should I pay for referrals? Is there any reason to add the meta description attribute? Answering questions related to your industry is a great way to get after the long tail. For this on I’ll get a little more technical. Micro data is a form of HTML property mark-up used specifically by search engines (plural) to help them identify certain kinds of text like addresses, movie titles and product descriptions. Micro data is crucial for straight ecommerce sites and it’s use will increase over time for just about every type of business. Adding name, address and phone (NAP) rich snippets to every page, for example, is a solid bit of advice for any local business. In my realities blog post I wrote about in depth articles becoming more important in search. Google has released a set of micro data properties that specifically addresses in depth articles so there’s a good chance there will be more on this front to come. You won’t have to look any further than this MOZ study on the kind of content that draws the most links to see the need for more in depth content. Structured mark up has already entered in many ways. 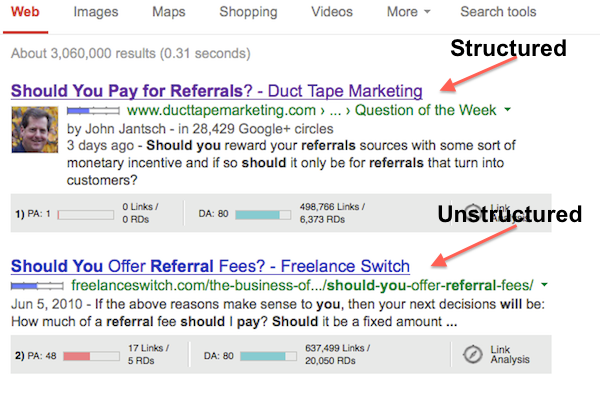 For example breadcrumb mark up produces a more structured appearance of indexed content. (See the example below produced with breadcrumbs enabled in the SEO plugin from Yoast) – this mark up shows up in the HTML on the page to help with navigation and in the way Google indexes and shows the results. You can add the in depth article micro data plugin to WordPress to avoid learning the specifics of coding with micro data. And by all means add the Google Authorship markup if you have not – you can find my advice on Google Authorship here. Want to get overwhelmed by this topic? Visit schema.org to really dig in. Networking for link relationships has taken on a bit of a popularity feel due to Google’s emphasis on authority when it comes to content. Links from sites that Google ranked highly have always been important, but now individuals inside of Google+ carry a great deal of weight as well. It’s important to build relationships in your industry with those authors that Google already thinks highly of. I’m not talking about stalking, I’m talking about discovering the most valuable relationships and finding ways to build value within them. Reverse Google image look up reveals list of places where this author contributes. Find those authors in your industry that appear with an author box in common searches with your industry and do a Google reverse image look up to find where they contribute content currently. This way you’ll turn up some great guest post opportunity possibilities for yourself as well as gain some insight into ways you can connect with authors of authority. So, that should keep your plate full for a few action packed days!